Cure your Wrist Pain Today. Effective treatment, Non Surgery. Discuss with our Hand Specialist for the Diagnosis, Treatment and Prognosis of your Wrist Pain. Call us +65 97731458 to schedule for an appointment. De Quervain’s tenosynovitis is a painful condition affecting the tendons on the thumb side of your wrist. If you have de Quervain’s tenosynovitis, it will probably hurt every time you turn your wrist, grasp anything or make a fist. Although the exact cause of de Quervain’s tenosynovitis isn’t known, any activity that relies on repetitive hand or wrist movement such as working in the garden, playing golf or racket sports or lifting your baby can make it worse. If the condition goes too long without treatment, the pain may spread farther into your thumb, back into your forearm or both. Pinching, grasping and other movements of your thumb and wrist aggravate the pain. If the pain continues to interfere with your daily life or activities, seek medical advice. 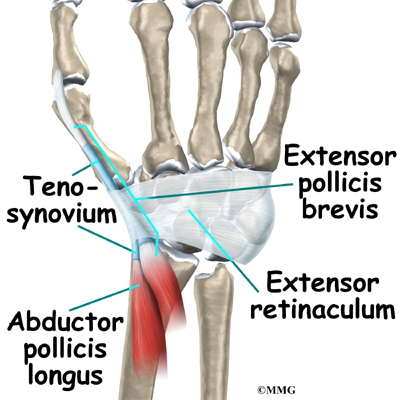 Chronic overuse of your wrist is commonly associated with de Quervain’s tenosynovitis. When you grip, grasp, clench, pinch or wring anything in your hand, you use two major tendons in your wrist and lower thumb. These tendons normally glide unhampered through the small tunnel that connects them to the base of the thumb. If you repeat a particular motion day after day, it may irritate the sheath around the two tendons, causing thickening that restricts the movement of the tendons. If de Quervain’s tenosynovitis is left untreated, it may be hard to use your hand and wrist properly. If the affected tendons are no longer able to slide within their tunnel, you may develop a limited range of motion. To diagnose de Quervain’s tenosynovitis, your doctor will examine your hand to see if you feel pain when pressure is applied on the thumb side of the wrist. Your doctor will also perform a test called the Finkelstein test. In a Finkelstein test, you bend your thumb across the palm of your hand and bend your fingers down over your thumb. Then you bend your wrist toward your little finger. If this causes pain on the thumb side of your wrist, you likely have de Quervain’s tenosynovitis. Imaging tests, such as X-rays, generally aren’t needed to diagnose de Quervain’s tenosynovitis. Treatment for de Quervain’s tenosynovitis may include medications, physical or occupational therapy, or surgery. Treatment is generally successful if begun early on, though the pain may recur if you can’t discontinue the repetitive motions that aggravate your condition. If you start treatment early on, your symptoms of de Quervain’s tenosynovitis should generally improve within four to six weeks. When de Quervain’s tenosynovitis starts during pregnancy, symptoms usually get better around the end of pregnancy or when breast-feeding stops. To reduce pain and swelling, your doctor may recommend using non steroid anti-inflammatory injection. Our doctor may also recommend injections into the tendon sheath to reduce swelling. If treatment begins within the first six months of symptoms, most people recover completely after receiving injections, often after just one injection. You may also see a physical or occupational therapist. These therapists may review your habits and give suggestions on how to make necessary adjustments to relieve stress on your wrists. Your therapist can also teach you exercises focused on your wrist, hand and arm to strengthen your muscles, reduce pain, and limit the irritation of the tendons. The therapist may also make a splint to keep your wrist and thumb from moving if off-the-shelf versions don’t fit you well. If your case is more serious, your doctor may recommend outpatient surgery. Surgery involves a procedure in which your doctor inspects the sheath surrounding the involved tendon or tendons, and then opens the sheath to release the pressure and restore free tendon gliding. Our Doctor will talk to you about how to rest, strengthen and rehabilitate your body after surgery. A physical or occupational therapist may meet with you after surgery to teach you new strengthening exercises and help you adjust your daily routine to prevent future problems.